Anglican Mainstream South Africa » Blog Archive » When will somone stop this rot in the anglican Church? When will somone stop this rot in the anglican Church? Dear friends let each of us make a personal resolve read and believe the bible in its plain and grammatical sense – THIS billboard does not illustrate THE ANGLICAN WAY!!!!! This justification on the website of hIghlights for all to see how far we have strayed from the biblical story in our thinking and if this was intentded to highlight the “warm fuzzy” feelings of the traditional christmas – all is does is show is the NEW warm fuzzy allinclusive uncrtical god. webmaster. To make the news at Christmas it seems a priest just needs to question the literalness of a virgin giving birth. Many in society mistakenly think that to challenge literalism is to challenge the norms of Christianity. What progressive interpretations try to do however is remove the supernatural obfuscation and delve into the deeper spiritual truth of this festival. Christian fundamentalism believes a supernatural male God who lived above sent his sperm into the womb of the virgin Mary. Although there were a series of miraculous events surrounding Jesus’ birth – like wandering stars and angelic choirs – the real miracle was his death and literal resurrection 33 years later. The importance of this literal resurrection is the belief that it was a cosmic transaction whereby the male God embraced humanity only after being satiated by Jesus’ innocent blood. The Christmas billboard on a local fundamentalist church sums up this thesis. It reads: “Jesus born 2 die 4 u!” His birth was just an h’orderve before the main Calvary course. No doubt on Christmas Eve when papers print the messages of Church leaders a few of them will serve up this fundamentalist thesis wrapped in a nice story. Progressive Christianity believes the Christmas stories are fictitious accounts designed to introduce the radical nature of the adult Jesus. They contrast the Lord and Saviour Caesar with the anomaly of a new ‘lord’ and ‘saviour’ born illegitimate in a squalid barn. At Bethlehem low-life shepherds and heathen travelers are welcome while the powerful and the priests aren’t. The stories introduce the topsy-turvy way of God, where the outsiders are invited in and the insiders ushered out. Progressive Christianity doesn’t overlook Jesus’ life and rush to his death. Rather it sees the radical hospitality he offered to the poor, the despised, women, children, and the sick, and says: ‘this is the essence of God’. His death was a consequence of the offensive nature of that hospitality and his resurrection a symbolic vindication. On Christmas Eve when papers print the messages of Church leaders one or two of them will offer up this progressive thesis, encouraging laughter, generosity, and maybe even controversy. Fundamentalism believes that Christianity is essentially about individual salvation and admission to an after-life off the planet. What one believes rather than how one behaves is paramount. This planet is merely a testing ground. Progressive Christianity however emphasizes behaviour above belief. How one treats ones neighbours, enemies, and planet is the essence of faith. The celebration of the birth of Jesus is a celebration of God in every birth and every person. Although fundamentalist and progressive Christianity stand in marked contrast to one another there are many other distinct and interesting theologies on Christmas. Yet the culture of the Church is such that differences are downplayed and commonality extolled. Variety is synthesized into a supposed unity creating a mushy middle way. Most church leaders follow this middle mush approach, trying to say something pertinent without offending anybody. Progressive Christianity is distinctive in that not only does it articulate a clear view it is also interested in engaging with those who differ. Its vision is one of robust engagement. If every Christian thought the same not only would life be deadly boring but also the fullness of God would be diminished. This is the consequence of its incarnational theology: God is among us; even among those we disagree with or dislike. One billboard that expresses middle mush reads, “I miss hearing you say ‘Merry Christmas’, and its signed ‘Jesus’. No one can take offense because no one is being asked to do or think anything particularly different, except say ‘Merry Christmas’. 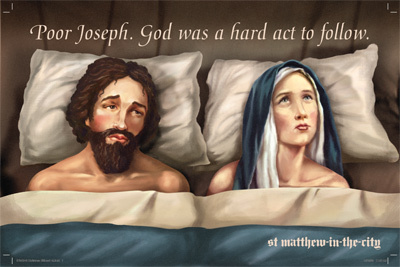 No doubt on Christmas Eve when papers print the messages of Church leaders most of them will serve up this middle mush. Jesus will be born in a palatial sanitized barn and every king and crook, religious and irreligious, will be surrounding him saying ‘Merry Christmas my friends!’ No reader will be asked to do or think anything risky, no reader will be offended, and no reader will write a critical response. They’ll just yawn and turn the page. This entry was posted on Saturday, December 19th, 2009 at 9:16 am	and is filed under Uncategorized. You can follow any responses to this entry through the RSS 2.0 feed. You can leave a response, or trackback from your own site.